Change is important for progress. Change ensures that the business environment stays fresh. It puts the organization on a viable path to success. It breaks monotony. Craig Borysowich covers a variety of business processes that are required to introduce and manage change. This book will arm the reader with the necessary skills to ensure they can effectively and successfully effect change in the organization. This book covers a range of business related issues and factors that lead to the ease and improvement of performance in the business environment. Whether one is instrumental in the introduction of change or merely a supporter, they need to understand the unintended consequences of change. There is need to understand how to handle situations that could arise from the change and how to deal with the aftermath. Utilizing the tools found within this book will raise the chances of success for a change agent. 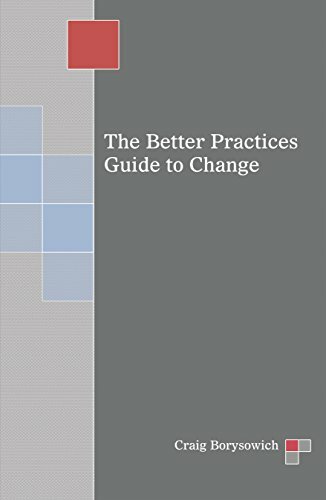 The Better Practices Guide to Change is filled with useful samples, examples, and templates that are directly applicable to the business environment. The author does a good job of delivering the content in an understandable manner. The outline encourages better perusing of the material. The format is efficient and does not distract the reader from the subject at hand. The worst thing about books in this genre is where the author gets braggy and condescending. The author does not commit that faux pas. He gives advice in a manner that leaves the reader feeling knowledgeable, smarter, and not stupid for not having known prior to reading. Everything from the format to the material is deeply researched. One can tell that there is experience. The author does not try to aggressively force his ideas onto the reader but rather imparts knowledge for the taking at the reader’s discretion. The subject has been exhaustively explained. All six sections cover different aspects of change in a way that leaves all questions answered. This book is like an elderly mentor. The author holds the reader’s hand through the sections, explaining each point and frequently pausing to check that they have understood. After reading this book, one will feel like they have just encountered their mentor through real world training. This book takes on a very serious tone. It may at times feel more like a textbook than a guide. However, this is not a deterrent to the delivery. One will still get the message. Craig has created a great reference guide. Often people who are responsible for the change process might have doubts about the change itself or doubt which route taken to achieve it. This book will help them review and revise if possible. It will affirm which plan is the correct one and therefore refresh one’s faith in the change. Change does not have to be a big scary ogre, and Craig ensures it is not.